The long-lasting paint system is said to provide ultimate protection while being decorative, thus meeting the most demanding specifications, reducing lifecycle costing through minimised cyclical maintenance and repainting and enhancing the sustainability of projects. The high-quality range of multi-layer flooring systems and coatings relies on low-VOC (volatile organic compound) water-based products. The Denmark-headquartered paints giant is fully geared to penetrate the Saudi market with this new system which is being produced at its Dammam factory. The production facility has enough capacity to produce Strata paints to cover the requirements of the entire Saudi market, according to Ahmed Abdelaziz, regional sales and marketing director – decorative paints – Middle East West. Strata is Hempel’s stand-alone brand that aims to fulfil and serve the market requirements for top-quality floor coating systems supported by tests results that meet and exceed the standards of the market, he says. “We have received a very positive feedback from our customers and are receiving inquiries as well as approvals for our specifications. In fact, we have already supplied a few major projects in the kingdom including factories,” he continues. Abdelaziz is keenly eyeing the new industrial cities in the kingdom, which according to him provide the highest potential for business. He says approvals have also been obtained for Strata for forthcoming projects in both Kuwait and Saudi Arabia. “We will start supplying to them very soon,” he adds. With the Strata system, Hempel aims to deliver best-in-class abrasion resistance and mechanical strength for long-lasting protection in demanding applications. 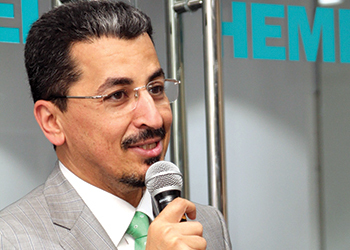 “Floors are exposed to different levels of wear and tear, and there is a product match in the Strata range for almost any situation, from light and medium to heavy-duty traffic,” says Mohamad Awny, Hempel Saudi Arabia’s business development and technical service manager. He says the systems is ideal for demanding applications, such as car parks, race-tracks, factories, hotels, villas and aircraft hangars. The range also includes odour-free coatings for areas where strict standards have been set for indoor air quality, and anti-microbial products for food production and laboratories. Awny further says Strata is a perfect solution for concrete floor coating because of its exceptional durability and can be easily applied in parking, race-tracks, warehouses, road and asphalt marking, garages, power stations, stairs and even aircraft hangars. Strata’s best-in-class abrasion resistance and mechanical strength has been proven in extensive tests at accredited independent laboratories, as well as through onsite application tests, he says. The products are available in a wide range of standard colours, and can be supplied in any requested colour. “Strata as a solution system, and not just a paint, is an ideal choice for industrial projects and hygiene-focused projects like hospitals, food industries, malls, hotel kitchens, airports, hypermarkets and showrooms,” says Awny. He says Hempel’s specialised flooring technical department gives proper advice to customers to choose the most appropriate system for their projects, and has even prepared a brochure on correct surface preparation. Hempel has a history of contributing to Saudi Arabia’s economic growth since it manufactures its products in the country, relies on locally produced material and employs Saudis. He says the company offers complete training to sales and technical services staff on all new products that involve practical training on application and problem-solving and surface preparation. Hempel is a world-leading coatings supplier for the decorative, protective, marine, container and yacht markets. It officially unveiled the new Hempel Group brand identity in July, as part of its 100-year anniversary celebrations in Copenhagen, Denmark.